This is an instant chocolate peda recipe made with sweetened condensed milk, cocoa powder and milk powder. Kids will love this chocolaty peda very much. This recipe is very easy to make, takes only 15 minutes and is very convenient especially when you are hard pressed for time. Even bachelors can try this. This also make a nice Diwali gift. 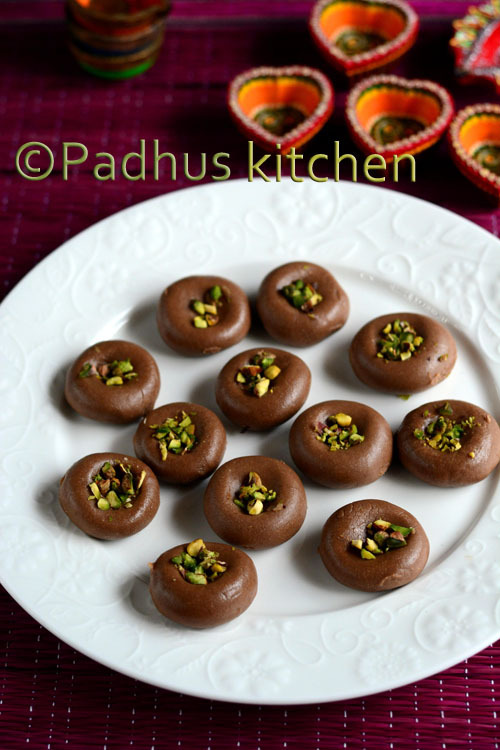 Learn how to make chocolate peda following this easy recipe with step wise pictures. Chop pistachio finely and keep it aside. In a non stick pan or heavy bottomed pan, melt butter over low heat. Switch off the heat and add condensed milk, milk powder and cocoa powder. Mix well so that there are no lumps. Then turn on the heat and cook stirring continuously. Once it starts leaving the sides of the pan as shown below, remove from heat and keep stirring for a few seconds. When the mixture is warm, grease your fingers with ghee and make 10 or 12 equal smooth balls from the mixture. Make a dent/impression with your thumb and fill pistachio in it. As it cools it will harden. That's it. Chocolate peda is ready. It tastes best the next day. It is be a little sticky, if you taste it immediately after preparing. Give it some time (atleast 3-4 hours) for it to set. Once set, it tastes great. It is more like a chocolate fudge. Note - If you over cook the mixture, the peda will turn hard and develop cracks. You can add a little milk and cook to soften it. If you are unable to make balls, cook it for a few more minutes. Storage and Shelf life - Stays good for a day or two at room temperature and for a week in the refrigerator. If stored in refrigerator, bring it to room temperature before serving the pedas. Her dear,I made these today. So soft and silky. I was happy to note that they were not very sweet.Perfect.Have made Pedha earlier in the micro but always over cook them. This time I have nailed it.My daughter absolutely went bonkers on seeing the photo and insisted i make them now. Am so happy i did...All your other recipes are also very interesting. looks so delicious, will definitely try it out. All your posts are toooooo good!! Hello from Nova Scotia, Canada! I made this recipe for my Girl Guide unit as we are having a Diwali themed party. Thanks for an easy to follow recipe.